McCarthy Garden has a menu with over 74 items; our variety is sure to satisfy even the most particular tastes. We have family dinners for two to eight people, providing generous portions for a great deal. Try one of our chef specials such as scallops with sautéed beef or Shanghai noodle. Start your meal with a crispy appetizer such as French fries, a homemade egg roll, or one of many other favorites. 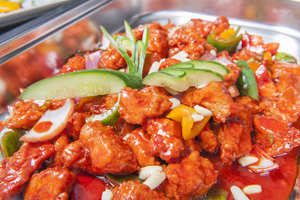 We also offer soups, chop suey, chow mein, lo mein, egg foo young, pork, pareribs, and a number of dishes made with chicken, beef, or seafood. Check out the full menu below.